The most popular Cornish seaside resort is Newquay which was once a flourishing fishing port until the shoals of pilchards gradually disappeared from the coastal waters. Nowadays the harbour, is filled with pleasure boats, and there is a magnificent stretch of beach, with lofty cliffs and fascinating caves beyond. 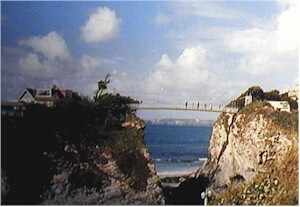 Newquay is also one of Englands most important surfing centers. Newquay is probably the most popular family holiday resort in Cornwall, yet less than a century ago it was only a small pilchard fishing village. Newquay has everything for the holiday maker, beaches, excellent surfing, gardens, fishing, and cliff walks. Towans beach is the sheltered end of a mile long stretch of fine, flat, firm sand ( practical for wheel chair users ) with plenty of space at low tide. Cliff walks close by. All the amenities of a large resort are available as it is very close to the town. Fistral beach is a wide expanse of flat firm wet sand just outside Newquay. This is a very popular surfing beach and has a life guard in season. Snack and ice creams and hire of beach goods and surf boards is available on the beach. One must walk 10 minutes to find a pub. Dogs are welcome on Fistral beach all year.